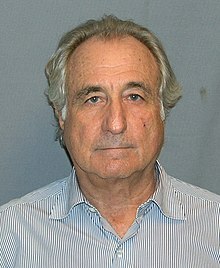 Bernard Lawrence "Bernie" Madoff (pronounced /ˈmeɪdɒf/; born April 29, 1938) is an American former investor, former stockbroker and former non executive chairman for NASDAQ Stock Market. He is the admitted operator of a Ponzi scheme which is the largest financial fraud in United States history. In March 2009, Madoff pleaded guilty to 11 federal felonies and admitted to turning his wealth management business into a massive Ponzi scheme. Thousands of investors lost billions of dollars. Madoff said he began the Ponzi scheme in the early 1990s. However, federal investigators believe the fraud began as early as the 1970s. The people who are hunting for the missing money believe the investment operation may never have been legitimate. The amount missing from client accounts, including fabricated gains, was almost $65 billion. The court-appointed trustee estimated actual losses to investors of $18 billion. On June 29, 2009, he was sentenced to 150 years in prison, the maximum allowed. Madoff is of Jewish descent. He is married to Ruth. The elder of their two sons committed suicide by hanging in 2010. The younger son died of lymphoma in 2014. In December 2013, Madoff suffered from a heart attack. In January 2014, he said he has stage 4 kidney cancer. ↑ "Madoff Says He Is Happier in Prison Than Free". The New York Times. Reuters. October 27, 2011. Retrieved October 28, 2011. ↑ Kolker, Carlyn; Tiffany Kary and Saijel Kishan (December 23, 2008). "Madoff Victims May Have to Return Profits, Principal". Bloomberg News. Retrieved December 24, 2008. ↑ 6.0 6.1 Safer, Morley (September 27, 2009). "The Madoff Scam: Meet The Liquidator". 60 Minutes. CBS News. pp. 1–4. Retrieved September 28, 2009. ↑ Bray, Chad (March 12, 2009). "Madoff Pleads Guilty to Massive Fraud". The Wall Street Journal. Dow Jones, Inc. Retrieved March 12, 2009. ↑ "Bernard Madoff gets 150 years behind bars for fraud scheme". CBC News. June 29, 2009. Retrieved June 29, 2009. ↑ "Bernie Madoff recovering from heart attack, battling kidney cancer as he rots in federal prison". New York Daily Post.com. Retrieved September 3, 2014. This page was last changed on 11 January 2019, at 16:48.